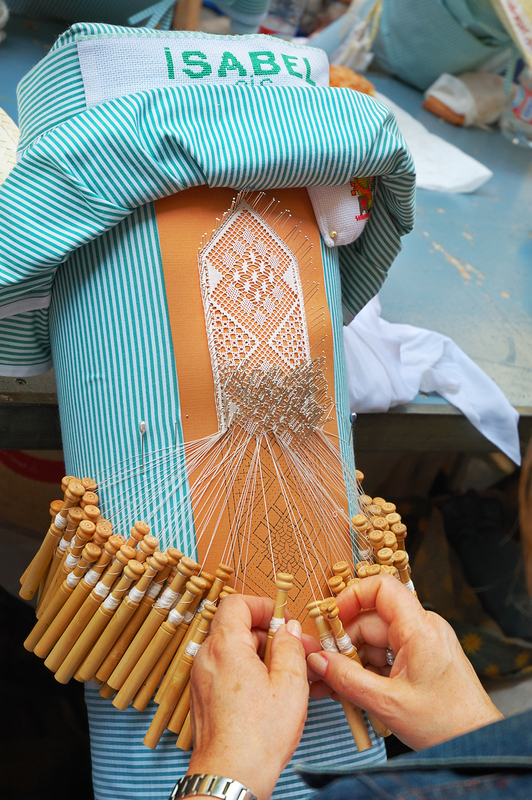 Call it bobbin lace, pillow lace, bone lace or simply lacework, this technique, in which thread, pins and shuttles are dexterously combined, may not compete with sophisticated lace making machines that produce complex designs but definitely it is much more artistic. I mean, you can enter a drawing in some computer program to automatically weave an elaborate piece of lace but you will lose art and tradition in the process. There were women of all ages and even some young boys. They were extremely skillful and it was really amusing to be standing there witnessing the stubborn endurance of this ancient medieval craft that is reluctant to disappear. See also Bobbin Lace (Encaje de Bolillos), a previous post with a brief explanation of the process and an illustrative video. That is so amazing! I would love to watch one of them at work. I am always happy to hear about old crafts being continued in our modern age. This has always fascinated me. I could watch for hours, mesmerised! Great shot! Wonderfull, another form of art, excellent presentation could go directly into a magazine of 'lace'. Well done! Excellent posting. This is Art! Yo are Master. Congratulations!!!! That's amazing!! Great photo. I could never do it (the lacing I mean, probably the photo too)! bobbin lace is one of d most lovable art. thanks for d great service u do helping with d working & d designs. am one d best interested perons of ur site. all d best & well wishers.